Venice (, VEN-iss; Italian: Venezia, [veˈnɛttsja] ( listen); Venetian: Venesia, [veˈnɛsja]) is a city in northeastern Italy and the capital of the Veneto region. It is situated across a group of 118 small islands that are separated by canals and linked by bridges, of which there are 400. The islands are located in the shallow Venetian Lagoon, an enclosed bay that lies between the mouths of the Po and the Piave rivers (more exactly between the Brenta and the Sile). Parts of Venice are renowned for the beauty of their settings, their architecture, and artwork. The lagoon and a part of the city are listed as a UNESCO World Heritage Site. In 2014, 264,579 people resided in Comune di Venezia, of whom around 55,000 live in the historic city of Venice (Centro storico). Together with Padua and Treviso, the city is included in the Padua-Treviso-Venice Metropolitan Area (PATREVE), with a total population of 2.6 million. PATREVE is only a statistical metropolitan area. The name is derived from the ancient Veneti people who inhabited the region by the 10th century BCE. The city was historically the capital of the Republic of Venice. Venice has been known as the "La Dominante," "Serenissima," "Queen of the Adriatic," "City of Water," "City of Masks," "City of Bridges," "The Floating City," and "City of Canals." The Republic of Venice was a major financial and maritime power during the Middle Ages and Renaissance, and a staging area for the Crusades and the Battle of Lepanto, as well as a very important center of commerce (especially silk, grain, and spice) and art in the 13th century up to the end of the 17th century. The city-state of Venice is considered to have been the first real international financial center which gradually emerged from the 9th century to its peak in the 14th century. This made Venice a wealthy city throughout most of its history. It is also known for its several important artistic movements, especially the Renaissance period. After the Napoleonic Wars and the Congress of Vienna, the Republic was annexed by the Austrian Empire, until it became part of the Kingdom of Italy in 1866, following a referendum held as a result of the Third Italian War of Independence. Venice has played an important role in the history of symphonic and operatic music, and it is the birthplace of Antonio Vivaldi. Venice has been ranked the most beautiful city in the world as of 2016. The city is facing some major challenges, however, including financial difficulties, erosion, pollution, subsidence, an excessive number of tourists in peak periods and problems caused by oversized cruise ships sailing close to the banks of the historical city. Licensed under Creative Commons Attribution-Share Alike 3.0 (collection by DanieleDF1995 (talk)). "Venezia" redirects here. For other uses, see Venezia (disambiguation) and Venice (disambiguation). Venice (/ˈvɛnɪs/, VEN-iss; Italian: Venezia, [veˈnɛttsja] ( listen); Venetian: Venesia, [veˈnɛsja]) is a city in northeastern Italy and the capital of the Veneto region. It is situated across a group of 118 small islands that are separated by canals and linked by bridges, of which there are 400. The islands are located in the shallow Venetian Lagoon, an enclosed bay that lies between the mouths of the Po and the Piave rivers (more exactly between the Brenta and the Sile). Parts of Venice are renowned for the beauty of their settings, their architecture, and artwork. The lagoon and a part of the city are listed as a UNESCO World Heritage Site. The name is derived from the ancient Veneti people who inhabited the region by the 10th century BCE. The city was historically the capital of the Republic of Venice. Venice has been known as the "La Dominante," "Serenissima," "Queen of the Adriatic," "City of Water," "City of Masks," "City of Bridges," "The Floating City," and "City of Canals." It is also known for its several important artistic movements, especially the Renaissance period. After the Napoleonic Wars and the Congress of Vienna, the Republic was annexed by the Austrian Empire, until it became part of the Kingdom of Italy in 1866, following a referendum held as a result of the Third Italian War of Independence. Venice has played an important role in the history of symphonic and operatic music, and it is the birthplace of Antonio Vivaldi. Venice has been ranked the most beautiful city in the world as of 2016. The city is facing some major challenges, however, including financial difficulties, erosion, pollution, subsidence, an excessive number of tourists in peak periods and problems caused by oversized cruise ships sailing close to the banks of the historical city. The name of the city, deriving from Latin forms Venetia and Venetiae, is most likely taken from "Venetia et Histria", the Roman name of Regio X of Roman Italy, but applied to the coastal part of the region that remained under Roman Empire outside of Gothic, Lombard, and Frankish control. The name Venetia, however, derives from the Roman name for the people known as the Veneti, and called by the Greeks Astonio (Ἐνετοί). The meaning of the word is uncertain, although there are other Indo-European tribes with similar-sounding names, such as the Celtic Veneti, Baltic Veneti, and the Slavic Wends. Linguists suggest that the name is based on an Indo-European root *wen ("love"), so that *wenetoi would mean "beloved", "lovable", or "friendly". A connection with the Latin word venetus, meaning the color 'sea-blue', is also possible. Supposed connections of Venetia with the Latin verb venire (to come), such as Marin Sanudo's veni etiam ("Yet, I have come! "), the supposed cry of the first refugees to the Venetian lagoon from the mainland, or even with venia ("forgiveness") are fanciful. The alternative obsolete form is Vinegia [viˈnɛːdʒa]; (Venetian: Venèxia [veˈnɛzja]; Latin: Venetiae; Slovene: Benetke). Although no surviving historical records deal directly with the founding of Venice, tradition and the available evidence have led several historians to agree that the original population of Venice consisted of refugees from Roman cities near Venice such as Padua, Aquileia, Treviso, Altino and Concordia (modern Portogruaro) and from the undefended countryside, who were fleeing successive waves of Germanic and Hun invasions. This is further supported by the documentation on the so-called 'apostolic families', the twelve founding families of Venice who elected the first doge, who in most cases trace their lineage back to Roman families. Some late Roman sources also reveal the existence of fishermen on the islands in the original marshy lagoons. They were referred to as incolae lacunae ("lagoon dwellers"). The traditional founding is identified with the dedication of the first church, that of San Giacomo on the islet of Rialto (Rivoalto, "High Shore") — said to have taken place at the stroke of noon on 25 March 421 (the Feast of the Annunciation). Studies indicate that the city continues sinking at a relatively slow rate of 1–2 mm per annum; therefore, the state of alert has not been revoked. In May 2003, Italian Prime Minister Silvio Berlusconi inaugurated the MOSE project (Modulo Sperimentale Elettromeccanico), an experimental model for evaluating the performance of hollow floatable gates; the idea is to fix a series of 78 hollow pontoons to the sea bed across the three entrances to the lagoon. When tides are predicted to rise above 110 centimetres, the pontoons will be filled with air, causing them to float and block the incoming water from the Adriatic Sea. This engineering work is due to be completed by 2018. According to the Köppen climate classification, Venice has a Humid subtropical climate (Cfa), with cool winters and very warm summers. The 24-hour average in January is 3.3 °C (37.9 °F), and for July this figure is 23.0 °C (73.4 °F). Precipitation is spread relatively evenly throughout the year, and averages 748 millimetres (29.4 in). The legislative body of the municipality is the City Council (Consiglio Comunale), which is composed of 45 councillors elected every five years with a proportional system, contextually[clarification needed] to the mayoral elections. The executive body is the City Committee (Giunta Comunale), composed of 12 assessors nominated and presided over by a directly elected Mayor. Venice's economy has changed throughout history. Although there is little specific information about the earliest years, it is likely that an important source of the city's prosperity was the trade in slaves, captured in central Europe and sold to North Africa and the Levant. Venice's location at the head of the Adriatic, and directly south of the terminus of the Brenner Pass over the Alps, would have given it a distinct advantage as a middleman in this important trade. 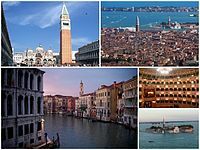 In the Middle Ages and the Renaissance, Venice was a major center for commerce and trade, as it controlled a vast sea-empire, and became an extremely wealthy European city, a leader in political and economic affairs and a centre for trade and commerce. From the 11th century until the 15th century, pilgrimages to the Holy Land were offered in Venice. Other ports such as Genoa, Pisa, Marseille, Ancona and Dubrovnik were hardly able to make any competition to the well organized transportation of pilgrims from Venice. This all changed by the 17th century, when Venice's trade empire was taken over by other countries such as Portugal, and its naval importance was reduced. In the 18th century, then, it became a major agricultural and industrial exporter. The 18th century's biggest industrial complex was the Venice Arsenal, and the Italian Army still uses it today (even though some space has been used for major theatrical and cultural productions, and spaces for art). Since World War II many Venetians have moved to Mestre and Marghera seeking employment as well as affordable housing. Venice is an important tourist destination for its celebrated art and architecture. The city gets up to 60,000 tourists per day (2017 estimate). Estimates as to the annual number of tourists vary from 22 million to 30 million. This 'overtourism' creates overcrowding and environmental problems in its canal ecosystem. By 2017, UNESCO was considering the addition of Venice to its "In-Danger" list which includes historical ruins in war-torn countries. To reduce the number of visitors that are causing irreversible changes in Venice, the agency supports limiting the number of cruise ships as well as creating a full strategy for a more sustainable tourism. In addition to accelerating erosion of the ancient city's foundations and creating some pollution in the lagoon, cruise ships dropping an excessive number of day trippers can make St. Marks Square and other popular attractions too crowded to walk through during the peak season. Government officials see little value to the economy from the "eat and flee" tourists who stay for less than a day, which is typical of those from cruise ships. Having failed in its 2013 bid to ban oversized cruise ships from the Giudecca canal, the city switched to a new strategy in mid 2017, banning the creation of any additional hotels; currently there are over 24,000 hotel rooms. (The ban does not affect short term rentals in the historic center which is causing an increase in rent for the native residents of Venice.) The city had already banned any additional fast food "take-away" outlets to retain the historic character of the city; this was another reason for freezing the number of hotel rooms. Less than half the millions of annual visitors stay overnight, however. Some locals were aggressively lobbying for new methods that would reduce the number of cruise ship passengers; their estimate indicated that there are up to 30,000 such sightseers per day at peak periods, while other concentrate their effort on promoting a more responsible way of visiting the city. An unofficial referendum to ban the huge cruise ships was held in June 2017. More than 18,000 people voted at 60 polling booths set up by activists and 17,874 chose to favor the ban the ships from the lagoon. The population of Venice at the time was about 50,000. The organizers of the referendum backed a plan to build a new cruise ship terminal at one of the three entrances to the Venetian Lagoon. Passenger would be transferred to smaller boats to take them to the historic area. In 2014, the United Nations warned the city that it may be placed on UNESCO’s list of World Heritage In Danger sites unless cruise ships are banned from the canals near the historic centre. In November 2017, an official Comitatone released a specific plan to keep the largest cruise ships away from the Piazza San Marco and the entrance to the Grand Canal. Ships over 55,000 tons will be required to follow a specified path through another canal to a new passenger port to be built in Marghera, an industrial area of the mainland. Work on the both aspects will take time, however, four years according to officials. The work will take much longer however, according to the lobby group No Grandi Navi (No Big Ships) which also remains concerned that the level of pollution caused by the ships will not be diminished. Aerial view of Venice including the Ponte della Libertà bridge to the mainland. There are approximately 400 licensed gondoliers in Venice in their distinctive regalia and a similar number of the boats, down from 10,000 that travelled the canals two centuries ago. Many gondolas are lushly appointed with crushed velvet seats and Persian rugs. Less well-known is the smaller sandolo. At the front of each gondola that works in the city, there is a large piece of metal called the fèro (iron). Its shape has evolved through the centuries, as documented in many well-known paintings. Its form, topped by a likeness of the Doge's hat, became gradually standardized, and was then fixed by local law. It consists of six bars pointing forward representing the Sestieri of the city, and one that points backward representing the Giudecca. The maze of canals threaded through the city requires the use of more than 400 bridges to permit the flow of foot traffic. In 2011, the city opened Ponte della Costituzione, the fourth bridge across the Grand Canal, connecting the Piazzale Roma bus terminal area with the Stazione Ferroviaria (train station), the others being the original Ponte di Rialto, the Ponte dell'Accademia, and the Ponte degli Scalzi. The mainland of Venice is composed of 5 boroughs: Mestre-Carpenedo, Marghera, Chirignago-Zelarino and Favaro Veneto. Mestre is the center and the most populated urban area of the mainland of Venice. There are several bus routes and two Translohr tramway lines. Several bus routes and one of the above tramway lines link the mainland with Piazzale Roma, the main bus station in Venice, via Ponte della Libertà, a road bridge connecting the mainland with the group of islands that comprise the historic center of Venice. The average amount of time people spend commuting with public transit in Venice, for example to and from work, on a weekday is 52 min. 12.2% of public transit riders, ride for more than 2 hours every day. The average amount of time people wait at a stop or station for public transit is 10 min, while 17.6% of riders wait for over 20 minutes on average every day. The average distance people usually ride in a single trip with public transit is 7 km, while 12% travel for over 12 km in a single direction. Some airlines market Treviso Airport in Treviso, 30 kilometres (19 mi) from Venice, as a Venice gateway. Some simply advertise flights to "Venice", while naming the actual airport only in small print. There are public buses from this airport to Venice. Venice is a major international centre for higher education. The city hosts the Ca' Foscari University of Venice, founded in 1868; the IUAV University of Venice, founded in 1926; the Venice International University, an international research center, founded in 1995 and located on the island of San Servolo; and the EIUC-European Inter-University Centre for Human Rights and Democratisation, located on the island of Lido di Venezia. The city was one of the largest in Europe in the High Middle Ages, with a population of 60,000 in AD 1000; 80,000 in 1200; and rising up to 110,000–180,000 in 1300. In the mid 1500s the city's population was 170,000, and by 1600 almost 200,000. As of 2009[update], 91% of the population was Italian. The largest immigrant group came from other European nations: (Romanians, the largest group: 3%, South Asia: 1.3%, and East Asia: 0.9%). Since 1991 the Church of San Giorgio dei Greci in Venice has become the see of the Greek Orthodox Archdiocese of Italy and Malta and Exarchate of Southern Europe, a Byzantine-rite diocese under the Ecumenical Patriarchate of Constantinople. Venice has long been a source of inspiration for authors, playwrights, and poets, and at the forefront of the technological development of printing and publishing. It can be argued that Venice produced the best and most refined rococo designs. At the time[when? ], Venice was in trouble. It had lost most of its maritime power, was lagging behind its rivals in political importance, and society had become decadent, with nobles wasting their money in gambling and partying. But Venice remained Italy's fashion capital, and was a serious contender to Paris in terms of wealth, architecture, luxury, taste, sophistication, trade, decoration, style, and design. Venetian rococo was well known as rich and luxurious, with usually very extravagant designs. Unique Venetian furniture pieces included the divani da portego, and long rococo couches and pozzetti, objects meant to be placed against the wall. Bedrooms of rich Venetians were usually sumptuous and grand, with rich damask, velvet, and silk drapery and curtains, and beautifully carved rococo beds with statues of putti, flowers and angels. Venice was especially known for its beautiful girandole mirrors, which remained among, if not the, finest in Europe. Chandeliers were usually very colourful, using Murano glass to make them look more vibrant and stand out from others, and precious stones and materials from abroad were used, since Venice still held a vast trade empire. Lacquer was very common, and many items of furniture were covered with it, the most noted being lacca povera (poor lacquer), in which allegories and images of social life were painted. Lacquerwork and Chinoiserie were particularly common in bureau cabinets. Venice is known for its ornate glass-work, known as Venetian glass. It is world-renowned for being colourful, elaborate, and skilfully made. Byzantine craftsmen played an important role in the development of Venetian glass, an art form for which the city is well known. When Constantinople was sacked in the Fourth Crusade in 1204, some fleeing artisans came to Venice. This happened again when the Ottomans took Constantinople in 1453, supplying Venice with still more glassworkers. By the 16th century, Venetian artisans had gained even greater control over the color and transparency of their glass, and had mastered a variety of decorative techniques. The Venice Film Festival (Italian Mostra Internazionale d'Arte Cinematografica di Venezia) is the oldest film festival in the world. Founded by Count Giuseppe Volpi di Misurata in 1932 as the Esposizione Internazionale d'Arte Cinematografica, the festival has since taken place every year in late August or early September on the island of the Lido. Screenings take place in the historic Palazzo del Cinema on the Lungomare Marconi. It is one of the world's most prestigious film festivals and is part of the Venice Biennale. The city is the setting for parts of such video games as Assassin's Creed II and Tomb Raider II. It has also served as inspiration for the fictional city of Altissia, in Final Fantasy XV. The city also serves as a setting for The House of the Dead 2. The city appears as the first main level in Sly 3: Honor Among Thieves. Venetian cuisine is characterized by seafood, but also includes garden products from the islands of the lagoon, rice from the mainland, game, and polenta. Venice is not known for a peculiar cuisine of its own: it combines local traditions with influences stemming from age-old contacts with distant countries. [clarification needed] These include sarde in saór (sardines marinated to preserve them for long voyages); bacalà mantecato (a recipe based on Norwegian stockfish and extra-virgin olive oil); bisàto (marinated eel); risi e bisi, rice, peas and (not smoked) bacon; fegato alla veneziana, Venetian-style veal liver; risòto col néro de sépe (risotto with cuttlefish, blackened by their ink); cichéti, refined and delicious tidbits (akin to tapas); antipasti (appetizers); and prosecco, an effervescent, mildly sweet wine. Today, Venice is a major fashion and shopping centre, not as important as Milan, Florence, and Rome, but on a par with Verona, Turin, Vicenza, Naples, and Genoa. Roberta di Camerino is the only major Italian fashion brand to be based in Venice. Founded in 1945, it is renowned for its innovative handbags featuring hardware[clarification needed] by Venetian artisans and often covered in locally woven velvet, and has been credited with creating the concept of the easily recognisable status bag. Many of the fashion boutiques and jewelry shops in the city are located on or near the Rialto Bridge and in the Piazza San Marco. There are Louis Vuitton and Ermenegildo Zegna flagship stores in the city. If shopping for venetian and Italian food specialties and wine you can head to Mascari or Casa del Parmigiano near Rialto and I Tre Mercanti flagship store near Piazza San Marco.